With 20 years of experience and 2 million visitors per year, Culturespaces is the European leader in private management of monuments and museums. Carrières de Lumières is open 10 hours a day, every day for 10 months in a year. The air in the quarry is heavily charged with dust and humidity. To face these difficult conditions, we needed robust and reliable products and also efficient customer service – and that’s what we get from Optoma. Both the sales people and technical support are very responsive, and the projectors fit our needs perfectly. For example, we specifically needed products that could project vertically, without overusing the lamp (the EX785, EW775, EH505 and W505 can do this). Another very useful feature is the ability to control the units via network, using almost all available protocols (Crestron, PJ-Link…). Optoma projectors have all kinds of useful features, and that’s what makes them so great. We’re using these projectors in extreme conditions and until now, we’ve had very few issues, which proves how robust the different models are. It’s delightful to be able to rely on these products! I specifically like the EH505 for its colour performance, high brightness, WUXGA resolution and excellent price/quality ratio. Our visitors also like our projections on the floor, for which we use the LED Laser ZW212ST projectors. The high contrast of these is impressive and the blacks very deep, I hope more of products of this kind are on the way. Carrières de Lumières is a very special project – you can’t just do what you have in mind, you have to adapt to the venue. Installing a whole projection system within this former quarry, in a very humid and dusty environment, was a real challenge. Now that the project is up and running, we try to make it even better both artistically and technically, and we have to make sure everything goes smooth throughout the season. Challenge: To create an audio visual show that is projected in a huge underground stone quarry onto multiple surfaces including the walls, ceilings and even the ground. Solution: Culturespaces selected a range of Optoma projectors to create an impressive audio visual show at Carrières de Lumières. Over 60 Optoma projectors were chosen due to their reliability, colour performance, high brightness, and excellent price/quality ratio. Results: Carrieres de Lumières in Les Baux-de-Provence, France, has been transformed into a backdrop for a stunning audio visual show. The show comprises thousands of digitised images of works of art that are projected onto all the former quarry’s surfaces, moving to the rhythm of a musical soundtrack. Fully immersed in image and sound, visitors can enjoy a unique sensory experience as they explore the image-rich universes of major painters in the history of art. Since 1977 the once disused quarry of ‘Carrières du Val d’Enfer’ had provided large scale audio visual displays and shows, due to the research and creation of Joseph Svoboda. 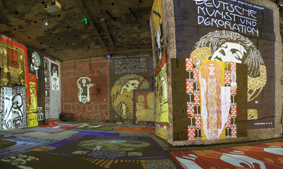 In 2011, Culturespaces were commissioned to take over the Carrières and renamed the site “Carrières de Lumières”. 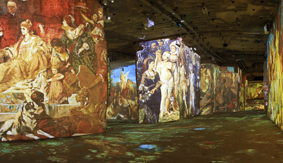 Themed on the History of Art, a series of audio visual shows, live shows, concerts and lectures are now being displayed in the Carrières de Lumières using a combination of high-performance technology; including a huge range of over 60 Optoma projectors. Originally a stone quarry, Carrieres de Lumières in Les Baux-de-Provence, France, is a huge space with irregular natural and man-made rock formations. The cavern is more than 16m high in places so the installation required both the projectors, and lenses used within them, to be extremely flexible. As a result, a variety of projectors and lens were needed, some installed to project vertically. Long-throw lenses were needed for images to reach the roof, while short-throw lenses were used within small nooks. The projectors also had to be visually unobtrusive, bright, able to project high quality video images in both landscape and portrait orientation and be capable of running ten hours a day for seven days a week. 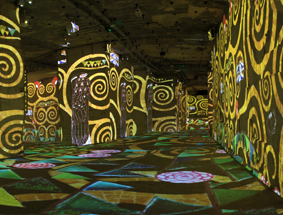 Optoma’s partnership with Culturespaces started towards the end of 2012, when a series of Optoma projectors were first installed at Carrières de Lumières. Culturespaces went on to install over 60 Optoma projectors, chosen due to their reliability, colour performance, high brightness, and excellent price/quality ratio. Amongst the projectors installed was the Optoma ProScene EH7500 and WT1 lens – chosen for the project for its ability to produce a high-quality large image from a short throw distance. Also, its outstanding brightness (6,500 lumens) and clear imagery created through the WUXGA resolution. A number of Optoma ProScene EH505’s were installed due to the projector’s wide lens shift range and off-axis short throw lens option; essential for projecting around obstacles formed by the irregular space. The EH505 includes 5,000-lumens, WUXGA resolution and powerful image blending tools that deliver spectacular image quality and outstanding brightness. The multiple lens options, zoom and focus adjustment ensured that installation was straightforward. Over 30 Optoma LED+ ZW212ST projectors were installed in the former quarry; some in portrait mode to project onto the floor. The ZW212ST was the obvious choice for the audio visual show because of its outstanding flexibility both in terms of projection capabilities and installation. The LED+ technology also offers consistent brightness and colour performance, with minimal degradation. This means the ZW212ST will maintain its out-of-the-box image quality without the need for expensive lamp changes throughout its lifetime. Additionally, a number of other Optoma projector models were installed, including the EX785, EW775, W505 and EW610ST. All Optoma projectors feature DLP® (Digital Light Processing) technology, pioneered by Texas Instruments, which produces high quality images and ensures the projector does not suffer colour degradation over time, as sometimes experienced in other projector technologies. The latest show opened to the public on 7th March 2013. Carrieres de Lumières has been transformed into a backdrop for a stunning audio visual experience. The show comprises thousands of digitised images of works of art that are projected onto all the former quarry’s surfaces, moving to the rhythm of a musical soundtrack. Fully immersed in image and sound, visitors can enjoy a unique sensory experience as they explore the image-rich universes of major painters in the history of art. The flexibility and reliability of the Optoma projectors has made it possible for Carrières de Lumières to run the spectacular audio visual show 10 hours a day, every day for 10 months in a year. Multiple surfaces are used in the show to give a sense of depth, whilst spectators are immersed in the projected images. The walls, ceiling and even the ground are completely covered, becoming a vast carpet of images. The Carrières de Lumières site demonstrates that access to art can be innovative and dynamic. Spectators are totally immersed in the images projected onto all the surfaces of the rock. Work by famous artists such as Klimt and Vienna currently feature; the subjects of the films are changed each year. Over 375,000 visitors enjoyed this innovative approach to art during 2013. With its cross-disciplinary approach, the Carrières de Lumières is now established as a cultural entertainment site, the programming of which brings together major names in the history of art and multimedia.